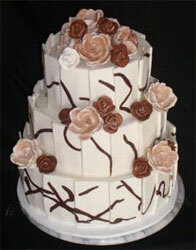 The consultation process is designed to ensure choosing your cake is a fun and exciting experience. You can either choose from the many existing designs or I can create a customised cake that is specific to your needs. I will work with you to create the perfect style that matches both the personality and the occasion of your event. I can discuss your requirements either by phone, email, or personally to suit you. From colours, flowers, style and how many guests you need to serve. Your finished cake will be delivered and set up at your venue. Due to the variety of factors that go into each of the cakes the pricing is determined on a per project basis. Some factors that I consider are the complexity of the design, the time invested in the design/creation of the cake and finally the number of servings. Is the cake to be served for dessert, with coffee/or bagged? What flavour cake are you after? What icing look (rough/smooth) or flavour, would you like? Flowers on cake? Fresh, Icing or other? Do you have sample cake pictures/drawings? Do you wish to keep the top tier? Is there air-conditioning where cake will be displayed?